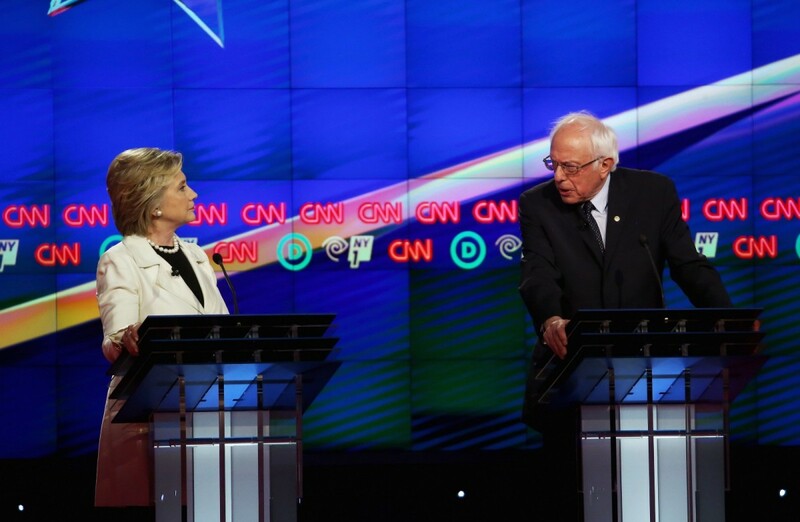 Clinton vs. Sanders: Who’s the Real ‘New Yorker’? The New York primary is not just a competition for votes; it’s a test to see which candidate is the stronger representative of the city’s culture. This year’s New York Democratic primary has turned into a competition for candidates to prove their New York authenticity. Both Vermont Senator Bernie Sanders and former Secretary of State Hillary Clinton call New York City their hometown, and each has spent the last month trying to convince voters there of their New York credentials. Today, all eyes will be on the Big Apple, mainly because of the whopping 291 delegates the state holds, but also because the primary will determine which democratic candidate is the true New Yorker. Many New Yorkers take immense pride in their local identity. There’s James Baldwin’s proclamation that “Whoever is born in New York is ill-equipped to deal with any other city: all other cities seem, at best, a mistake, and, at worst, a fraud,” in Just Above My Head; there’s Alicia Keys belting out in “Empire State of Mind” that New York is the “concrete jungle where dreams are made of”; there’s the fire hydrant scene in Do the Right Thing. The New Yorker ego is sustained by resilience, or rather the ability to thrive in a city that exhausts and pushes out so many. Both Clinton and Sanders have spotty histories with New York, meaning neither candidate can lay much claim to geographic longevity. As the media scrutinizes Clinton and Sanders’ pizza-eating methods and bubble tea consumption, the primary has been largely narrated as a competition between two representations of New York culture. 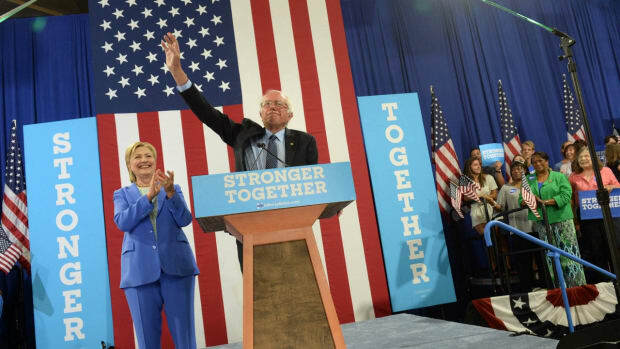 Clinton and Sanders demonstrate two uniquely different sects of New York society. Clinton, who is originally from Chicago, became the First Lady of Arkansas in 1979. Decades later, she scrambled to make the move to New York in preparation of the Senate elections, purchasing a $1.7 million Dutch colonial home in Chappaqua, a town in Westchester County about 30 miles outside of New York City. 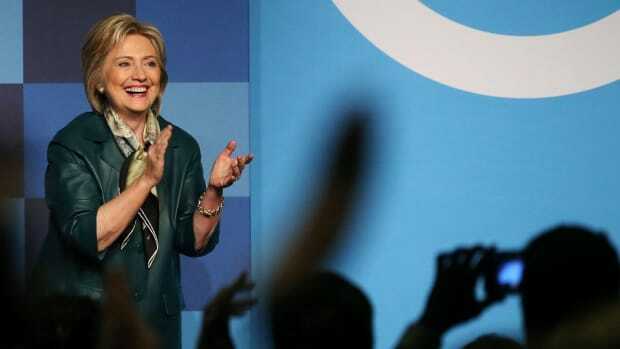 Clinton was elected New York senator in 2001, a position she served in until 2009. On her latest presidential bid, she’s managed to maintain her local status by setting up her campaign headquarters in Brooklyn. Clinton and Sanders demonstrate two uniquely different sects of New York society. Sanders’ story is much the reverse. Born and raised in the Flatbush neighborhood of Brooklyn, Sanders moved to Vermont in 1964. It was in Plainfield, Vermont,where in 1971 he later started his political career. Although it’s been more than half a century since Sanders lived in New York, his thick Brooklyn accent is still as strongas ever. In a recent Saturday Night Live skit, comedian Kate McKinnon, playing a manic Clinton who’s desperate to prove her New York credibility, shouts, “I love being back in the fat apple!” before fake-eating a street hot dog in that exaggerated way only politicians seem to be capable of. 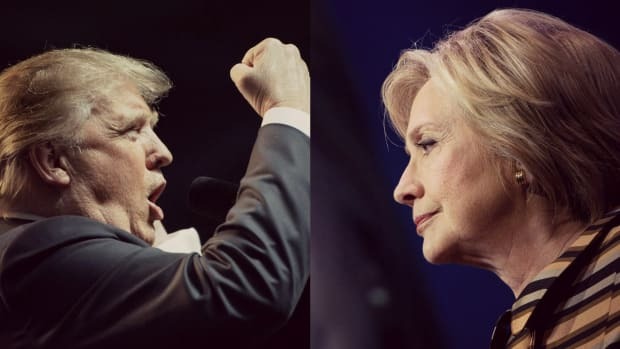 Though Clinton’s attempts to connect to New York residents may appear to be in vain to some,they appear to be working with many: A Siena College poll published earlier this month showed Clinton is leading Sanders by 52 to 42 percent in New York. But polls don’t tell the whole story. When it comes to daily participation, Sanders and Clinton have drawn drastically different levels of support. 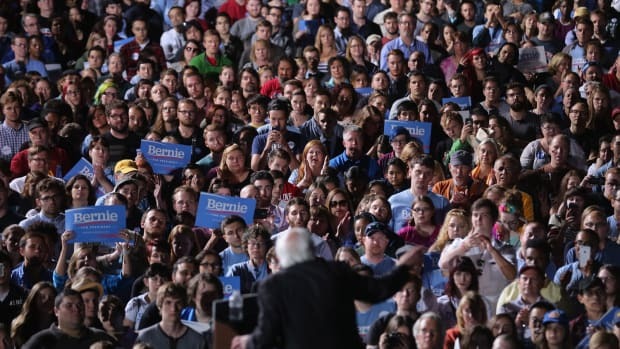 Sanders’ rallies in Harlem, Brooklyn, and Manhattan have drawn colossal crowds. On April 13, 27,000 people attended his rally in Washington Square Park. That same day, Clinton held her rally in Co-Op City, a community made up of 35 residential buildings tucked away in the North Bronx; she was able to corral around 400 people. Since their campaigning began in New York, Sanders has held rallies in public parks, beckoning thousands of attendees. Clinton’s events have mainly been held in smaller, indoor settings. Paring back his mantras about “millionaires and billionaires,” it’s Sanders’ image that’s become a major factor in pulling these momentous crowds. Along with the fact that he still thinks subway rides are paid with tokens, as a public figure, Sanders represents a pre-Rudy Giuliani version of New York City. 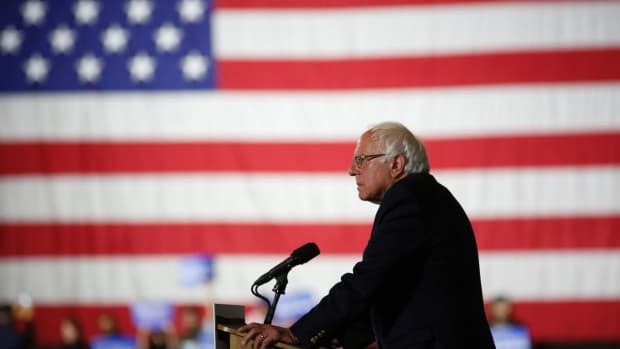 When compared to the popular perception of Clinton as an urban aristocrat, Sanders’ vehement ideas of taking down Wall Street evoke the days of affordable housing and inexpensive college tuition. Style-wise, Sanders’ rumpled shirts and penchant for chain restaurants bodes well with a certain subset of hipsters who romanticize the working-class lifestyle. His temporary Brooklyn campaign headquarters, a nondescript warehouse located near the Gowanus Canal, complete with wood beam vaulting and plastic furniture, is another token of his blue-collar branding. Clinton, on the other hand, has set up shop in an 80,000-square-foot office in a building in Brooklyn Heights that totes an annual rent of about $32 million, according to Capital New York. Finance, insurance, technology, and real estate have contributed nearly 35 percent to New York City’s total economic output. It’s the New Yorkers behind those industries that Clinton takes after. “Big bankers love Clinton,” writesPolitico’s William D. Cohan. But it’s not only Goldman Sachs and Morgan Stanley; it’s the finance industry at large, which has contributed its share of taxes to the city but has also spawned its own canonized culture of wealth. The influx of investment banks, hedge funds, and technology companies during the last two decades have made New York City cleaner and safer in some aspects, but also much more expensive. This (relatively) “new” New York City is the one that the Clinton camp has come to represent. She wants to keep the city shiny. The battle of who is the true New Yorker really boils down to the contentious definition of “New Yorker.” Sanders and his fans hold a candle to the more historic New Yorker, who lived during the days when apartment rental values actually mirrored inflation and college tuitions were still relatively cheap. Yet what Clinton symbolizes is the New York of the here and now—an expensive, tamer, safer city. 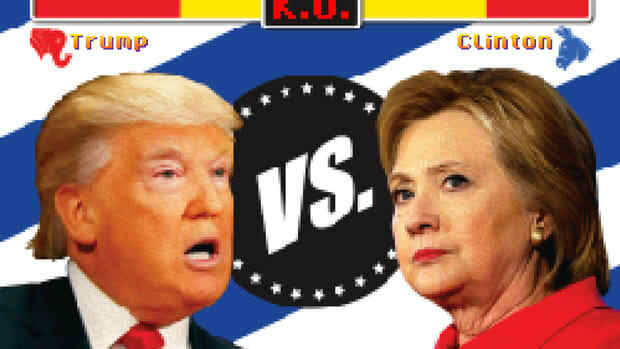 Today, New Yorkers decide which one will preside. Will Sanders Supporters Jump to Trump?